We offer racking positions in our warehouse in Aalter. * Your warehouse is overcrowed so you can not work efficiently. For any further information feel free to call us on +32 9 375 05 70 or send an email to info@vandotrans.be. As a logistic service provider we have the requisite know-how to expertly control and manage your stock supplies, allowing you to focus entirely on your core business. All the pallets we receive are registered in our warehouse management system. 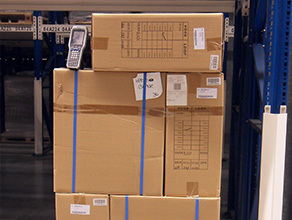 Using bar code scanning, we can trace your goods at any time. It also allows us to retrieve current and historical stock data. Our warehouses are secured with a modern high-end alarm system and we have a person registration system in place. The warehouse site is completely fenced off and provided with entrance gates secured by access keypads. Our warehouses are also pest screened on a permanent basis. This is done in a correct and environmentally friendly manner.